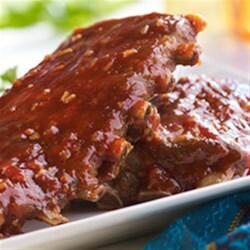 "Fall-off-the-bone tender, these baby back ribs cook long and slow in a tangy, spicy sauce." Season ribs with salt and pepper. Place in bottom of 5-quart slow cooker. Combine remaining ingredients in food processor and process until smooth. Cover ribs with sauce. Cook on low 8 to 10 hours, or on high 4 to 5 hours. Serve warm. Next-Day Use: Remove meat from bones and serve on Parker House rolls. The ribs were fall off the bone tender but the sauce was too bland. We dipped it in Sweet Baby Ray's. I will try a different BBQ recipe from this site. Will not make this again. will try this Recipe this week. it looks grate. Need to double the sauce. amazing! fall off the rib tender meat. ...this a a definite keeper!! The best crock pot ribs I have ever made! The entire family loved it and we could not stop eating them. They were perfect for an all day college football Saturday. Thanks for sharing.